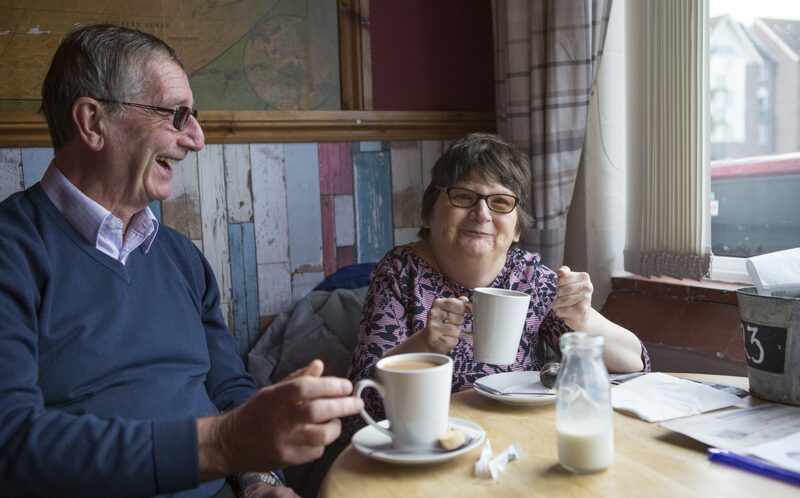 Torbay Mencap has played a valuable role in our community, supporting local people with learning difficulties and disabilities for nearly 70 years. As we know, while Torbay is a beautiful place to live and has much to be proud of, it has its own particular challenges. If you have loved ones or work with individuals with learning difficulties and disabilities you will know that some of the things many take for granted can be hard. For example: respite, recreational activities, socialising and making new friends. Without the resources of a City or County Council, funds are very limited locally and reducing year on year. We cannot rely on government or council grants to make these things happen. Here at Torbay Mencap we value these opportunities and are always looking at ways to improve the lives of those we love and care for. With this in mind, we would like you to think about joining our committee and helping us raise money for good causes. We have a mix of Committee members, some are retired and others are professionals in full time employment with young family commitments. Some can volunteer more time than others; this is fine. The committee is also a great support network for parents and carers who face their own challenges and stresses; we can listen, share experiences and advise. Anyone interested is welcome to come along and find out more about what we do. In particular we are interested to hear from parents or carers who have loved ones with Special Educational Needs. If you have experience of accounting, raising money, bid writing, working for a charity or are just motivated to help people – we would like to hear from you. Torbay Mencap will be holding our Annual General Meeting (AGM) on Thursday 20th June from 7 – 9pm. This is an open meeting and anyone is able to attend. Please come along and join us to find out more about what we do. Following another successful fundraising event, attended by 125 people, over £900 was raised for our appeal towards the spa therapy pool at Hollacombe. During the evening, we were entertained by the dulcet sounds of Riviera Concert Brass, and the wondrous voice of Theresa Moorin. All of our supporters and friends who attended to contribute to such a worthwhile cause. Torbay Mencap Members New Year Party was enjoyed by all. Request were made by members to return again next year. The Hotel chosen was THE BELGRAVE SANDS HOTEL, TORQUAY which was a perfect venue, the disabled facilities were amazing. The food was exceptional, the staff were so welcoming, even occasionally dancing with us during the disco, which was provided by Steve (who has done it for us for the last decade for free) was as usual perfect. Can’t wait for next year’s party! A new Changing Place Toilet has been opened at Paignton seafront beneath the shoreline restaurant. It’s equipped with a hoist to lift someone from wheelchair to toilet or to a changing table. The toilet is a washlet style capable of cleaning and drying someone in situ. The sink is user height adjustable for access. The full length adult changing table is fixed to the wall and is electrically height adjustable. The electrically powered hoist allows an adult or child lifted onto the table so that they may be changed with dignity. 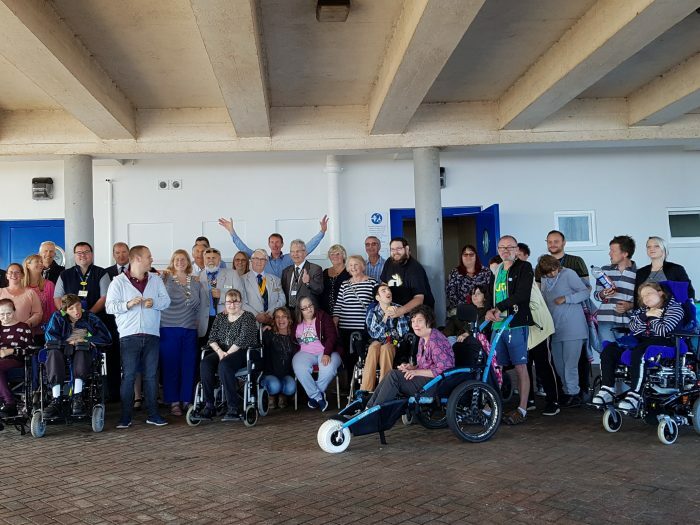 The availability of this special public toilet helps to enable people with profound physical impairment to enjoy all the events that take place on or near Paignton seafront, not to mention the beach. 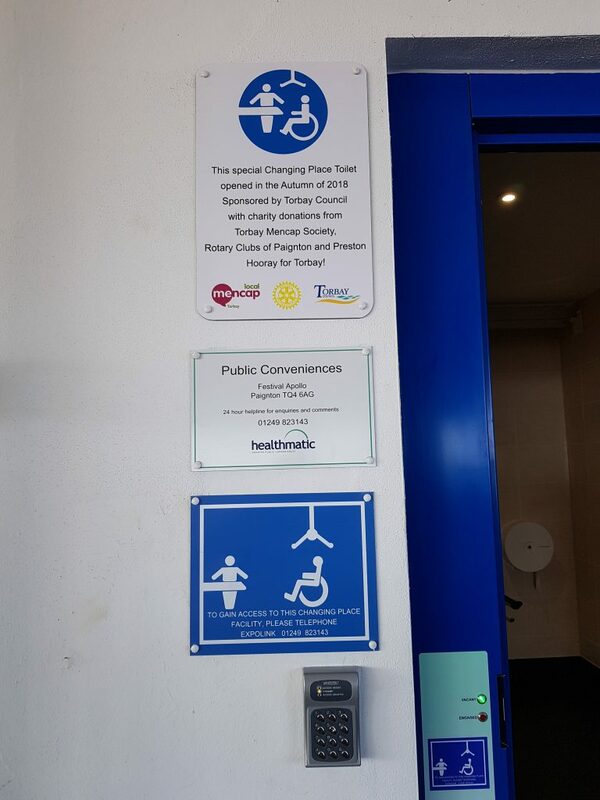 The Changing Place Toilet has been sponsored by Torbay Council with generous donations from Torbay Mencap Society, and the Rotary Clubs of Paignton and Preston. 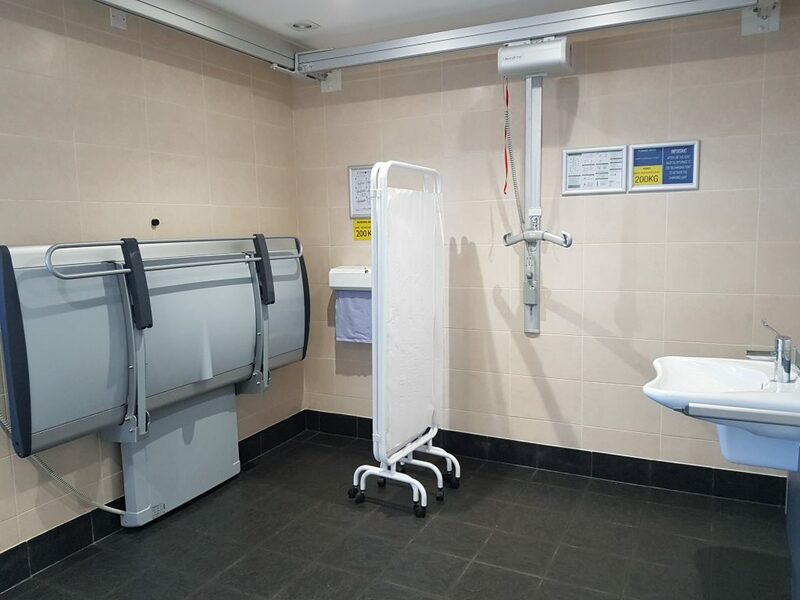 The NHS team at the Hollacombe Day Centre and the toilet installation company Healthmatic are to thank for ensuring that this facility sets the standard for all others to follow. Please do support this wonderful development by sharing the news of its installation with those people amongst your family, friends, neighbours, colleagues and acquaintances that might benefit. The facility could be of interest to people outside Torbay who may be encouraged to visit in future now that the logistics of their visit can be more conveniently managed. I’d like to think that the introduction of a Changing Place Toilet at Paignton seafront not only provides a very practical benefit but also indicates that the community cares for some of those amongst us who deserve a little extra consideration. Hooray for Torbay!